The 2016 Chevrolet Silverado HD is the truck for Chevy lovers who need significantly more muscle than what the standard Silverado offers. The 2016 chevrolet silverado 3500 hd double cab electric vehicle qualifies for a federal tax credit of up to $7,500, effectively reducing the net base price. The Silverado 2500HD and 3500HD for 2016 are the heavy-duty versions of Chevy's full-size truck. While the Silverado HD pickups appear similar to their popular half-ton sibling, the 2500 and 3500 are beefier under the skin. With powerful engines, upgraded suspensions and the capability to tow over 23,000 pounds, the 2016 Silverado HD is meant to work hard and play hard, whether serving at a construction site or pulling the family boat. As with the Silverado 1500, the 2500 and 3500 come in a wide range, from a basic work truck to the luxurious High Country edition. Chevy's heavy-duty truck line still can't tow as much as a Ford Super Duty or Ram 3500, but for Silverado devotees looking for significant muscle, this is it. If you admire the style and feature content of the Chevy Silverado and need the ability to tow and haul heavy loads, say hello to the 2500 or 3500 heavy-duty series. An available diesel engine with 765 lb-ft of torque and a dually option add even more capability. Brand devotions aside, the Silverado HD pickups are outclassed by competitors. Ford and Ram offer more powerful engines and can tow up to 31,200 pounds. For a manual transmission, look to the Ram. A new, interesting competitor is the diesel-powered Nissan Titan XD that straddles the line between light- and heavy-duty. After a complete revamp last year, the Chevy Silverado HD enters 2016 with the new Digital Steering Assist feature for more comfort and responsiveness, wireless phone-charging capability, and updates to the infotainment system that include Apple CarPlay and Android Auto smartphone integration. 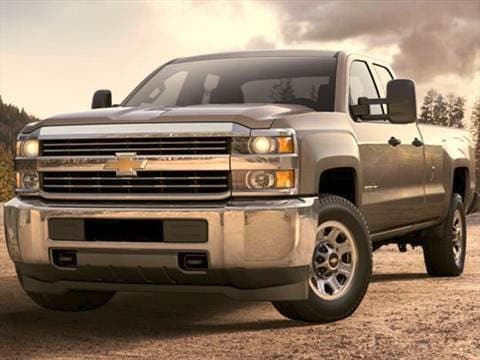 The latest Silverado HD is further proof of how much heavy-duty trucks have evolved. While still workhorses, they're equally adept at catering to passengers. In our time with the Chevy Silverado HD, it made highway miles slip by thanks to its spacious cabin and non-intrusive powertrain. After hours of seat time with and without a trailer in tow, we never felt worse for wear. When towing a 10,000-pound trailer up and down steep grades, the Silverado HD's Duramax diesel engine was more than adept. Even at an altitude of 5,000 feet, the powerful turbodiesel engine didn't complain and proved that it can control just about anything you'll ever need to tow. The trailers we towed experienced minimal wag, while the 6-speed Allison automatic transmission – working in conjunction with an exhaust brake – kept everything under control when going downhill. The latest-generation Silverado HD carries the premium interior that first appeared in the standard, half-ton Chevy pickup. Higher trims boast loads of creature comforts like leather-appointed and climate-controlled seats and tech necessities such as 7- or 8-inch touch-screen infotainment systems and multiple USB inputs for charging and syncing mobile devices. The cheapest way to feel like you’re driving an 18-wheeler without actually buying one. Paired with a 6-speed automatic Allison transmission, the Duramax turbodiesel engine is the strong, silent type as it operates quietly and pours on the power in an even fashion. As mentioned, the interior of the Silverado HD is among its highlights, at least in higher trims. At the low end, the WT (work truck) is basic but functional, with a 3-passenger 40/20/40-split bench with vinyl upholstery and a small, 4.2-inch color display for audio functions. We recommend stepping up to the LT or LTZ trim, which come with a more advanced infotainment system and flashes of bright work to complement cloth or leather seating. Double-cab versions can accommodate up to three passengers in back for a total of six (or five if you opt for bucket seats in front). The Silverado HD’s exterior also caught up with its half-ton sibling in last year's revamp. The 2500 and 3500 HD versions stand out with their big, boxy front end that's even more pronounced thanks to a raised power-dome hood. Regular-cab models are fitted with an 8-foot bed (long box), while double-cab and the roomier crew-cab models are available with the long box or a 6-foot-6 standard box. All 2500 and 3500 Chevy trucks have the helpful CornerStep bumpers for a better foothold when loading and unloading. The Chevy Silverado 3500HD is available as a dually with two pairs of rear wheels. Being that it is a work truck at its core, a base Silverado HD won’t spoil you much. It will, however, bring you a beefy V8 engine, anti-lock disc brakes, air conditioning, locking rear differential, locking tailgate and stability control. The basic audio system in the Silverado HD WT (work truck) is an AM/FM radio with USB and auxiliary ports. We recommend at least stepping up to the LT model, which includes the Chevrolet MyLink audio system with 8-inch display, Bluetooth connectivity, CD player, GM's OnStar communications system with built-in 4G LTE and Wi-Fi connectivity, cloth interior and power windows. Stepping up to the LTZ model adds further amenities such as heated leather seats, a steering wheel that telescopes as well as tilts, power-adjustable pedals, dual-zone climate control, keyless entry, rearview camera, and power front seats. Top-line High Country models – only available in crew-cab form – include navigation, heated and ventilated front seats, Bose audio system and perforated leather seating. The Duramax diesel engine is available on all models, as is 4-wheel drive. Also available, depending on trim, are a rear-seat entertainment package, sunroof, power-adjustable pedals, and active safety features like blind-spot monitoring, lane-departure warning and front-collision alert. Two V8 engines are offered in the 2016 Silverado 2500HD and 3500HD. Standard is a 360-horsepower 6.0-liter gasoline engine. For bigger jobs and more towing ability, there is the 6.6-liter Duramax turbodiesel engine, a roughly $8,400 option. Both engines are mated to a 6-speed automatic transmission. The gasoline engine is rated at 397 lb-ft of torque while the 6.6-liter V8 Duramax diesel churns out 765 lb-ft of twist. Maximum conventional trailering for the gasoline V8 is 14,500 pounds, or 14,800 when using a 5th wheel/gooseneck. The Duramax V8 diesel models increase those numbers to 20,000 and 23,200 pounds, respectively, and feature an exhaust-braking system. Additionally, bi-fuel versions of the Silverado HD are available that can switch from gasoline to compressed natural gas (CNG). You can get a 2016 Chevrolet Silverado 2500 HD regular-cab work truck for a Manufacturer’s Suggested Retail Price (MSRP) just over $34,000. Plan on spending at least a few thousand more for an LT version, or 10 ten grand more for an LTZ. A diesel-powered High Country Silverado 3500HD with options can kiss $70,000. Believe it or not, that price is in line with other maxed-out heavy-duty pickups. At the bottom end, a base Ram 2500 starts a couple of thousand below the Chevy, while a Ford Super Duty starts a touch below. The new Nissan Titan XD with a 5.0-liter Cummins diesel V8 is slated to start around $40,000. Check the Kelley Blue Book Fair Purchase Price to see what others in your area are paying for their 2016 Silverado HD. The resale value of the Silverado HD is impressive, and springing for the diesel engine will help keep the value high. The new Coca Dune interior is very relaxing and quite luxurious. The LTZ is your best bargain for the buck.